Day 2: If You Could Ask Your Customers One Thing, What Would it Be? Day 30: Where Does Your Business Stand Today, And Where Do You Hope To Be A Year From Today? A Challenge Wouldn't Be Complete Without a Reward, Right? Complete the challenge and we will not only feature your business right here on the blog and help spread the word of all the great things you shared along the way, but we will also send you a $50.00 Amazon.com gift card for successfully completing the challenge. 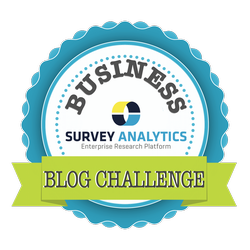 Remember to drop us a link in the comments to check out your blog as you conquer the business blog challenge. Beyond just the challenge, we hope you refresh and repeat some of the topics in the future. Because in case you didn’t already know - blogs that publish original and high quality content at least 15 times per month get 5x more traffic than companies that don’t blog on a regular basis. Small businesses (1-10 employees) tend to see the biggest gains in traffic when they post more original blog articles. Last but not least, companies that go the extra mile and increase their blogging from the average of 3-5 posts per month to 6-8 posts per month almost double their leads (Impact: 55 Blogging Statistics and Facts Everyone Should Know).